Today I realized that I never followed up with the post-GWA post that I promised. I hate not coming through on a promise that I've made, so here's the first recap of the trip. Before we even got out on the garden tours, I was drooling over plants. 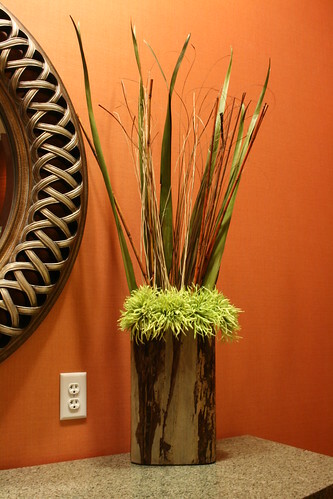 Check out this beautiful "floral" arrangement that was in the lobby of our hotel. There's nary a bloom in sight! That's the kind of creativity I like to see when it comes to gardening. Our first tour was of the Sarah P. Duke Gardens at Duke University. I remember visiting these gardens years ago when my family lived in Durham and seeing beds and beds of spring bulbs that took my breath away. Thankfully, the garden was equally captivating at summer's end. 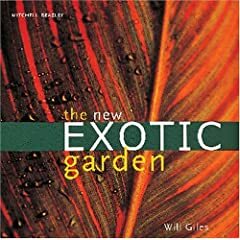 I was especially in love with the area known as the Terrace Gardens, since they used a host of great tropicals in striking combinations. 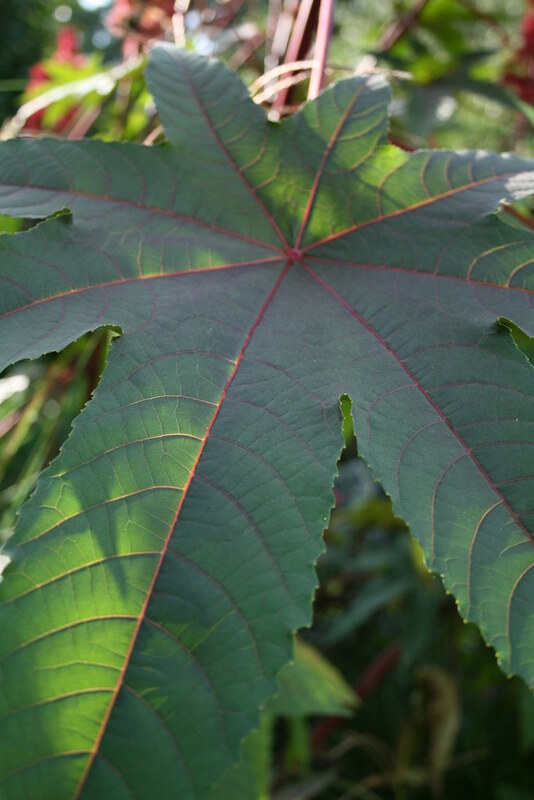 Here's a beautiful Ensete ventricosum, aka Abyssinian banana. Big surprise that I was drawn to it, eh? 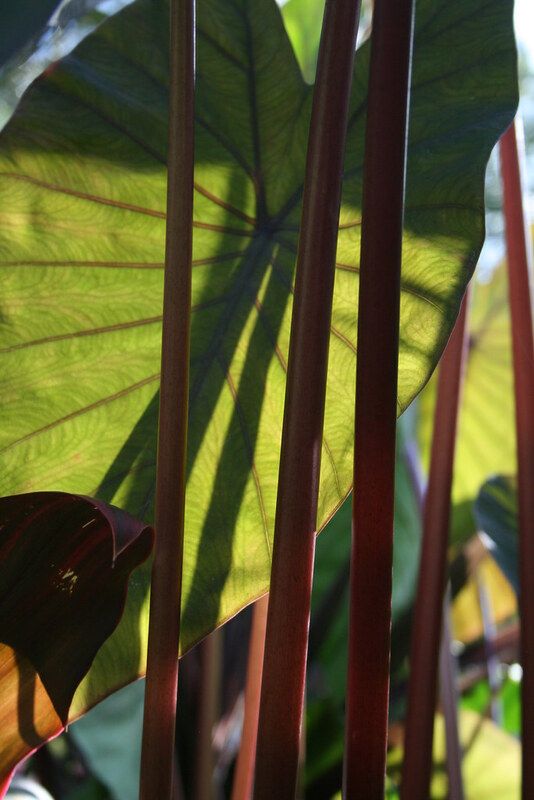 The afternoon light was absolutely amazing the way it danced through the elephant ear leaves. I have no idea what species or cultivar they were, but wow were they pretty! 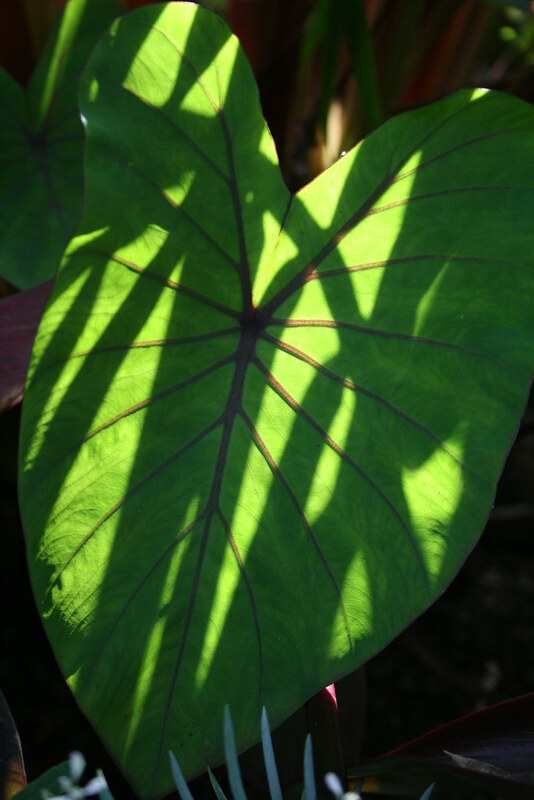 And as long as we're talking about elephant ears, check out this speckled one. 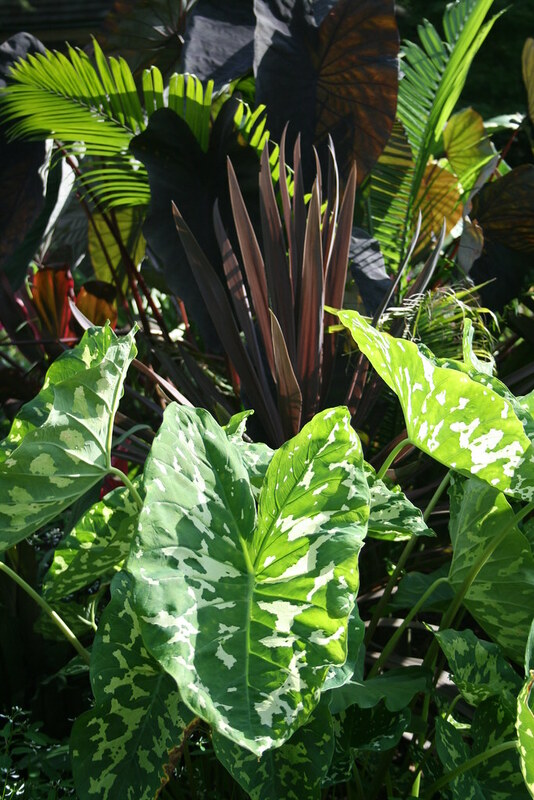 I'm thinking it might have been Alocasia 'Hilo Beauty.' You can just see some of the other bronze-leaved elephant ears from above in the background of this shot. 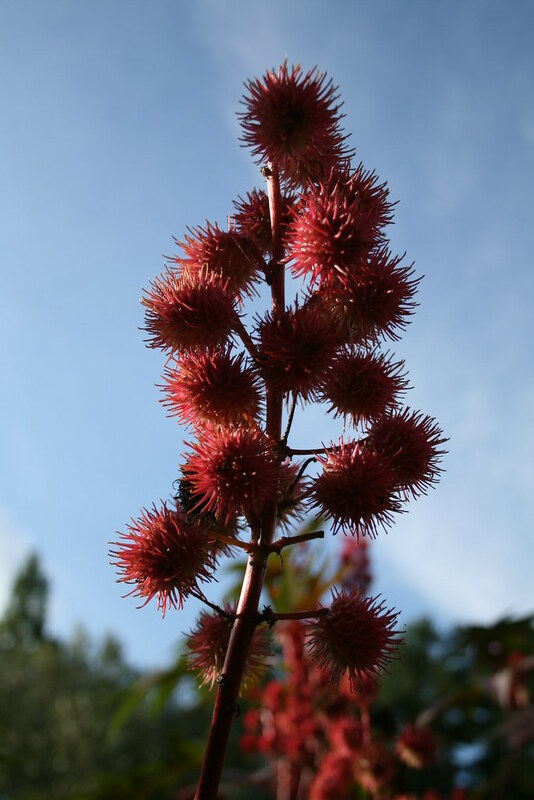 The Terrace Gardens also included red-leaved castor beans, possibly Ricinus communis 'Carmencita' I know I've definitely mentioned wanting a red-leaved castor bean at least once before. I love the bronze foliage and spiky seed pods. Okay, enough about specific plants for now. Let's talk about form. 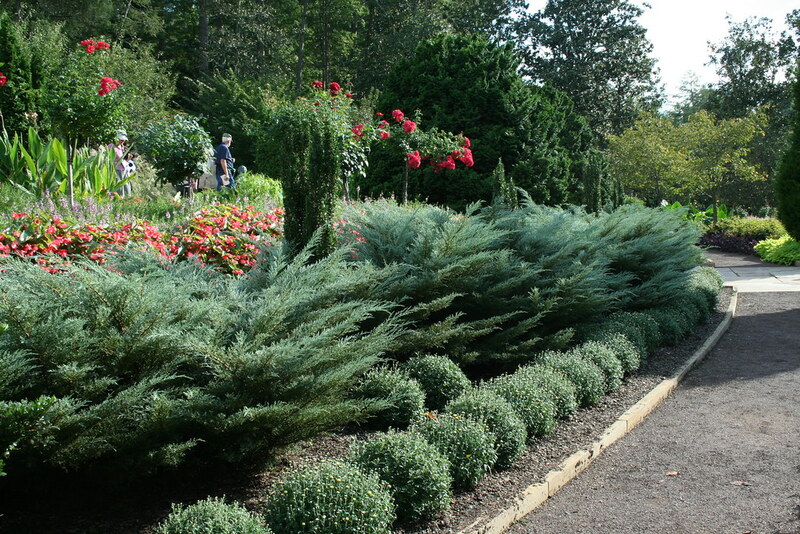 It was magical the way the various plant forms in this scene played against each other -- the tall hollies, the broad junipers, and the round mums. It was so energetic, even though all the plants were basically in the same color palette. I think there's a design lesson in there somewhere. I'll put up another post soon with photos of our visit to Plant Delights Nursery, the Raleigh Farmers' Market, and the JC Raulston Arboretum. The full set of photos is available on Flickr, in case you're craving more before then. Happy gardening! I know I said I was probably hanging up my garden blogging gloves, but what can I say? Spring sprang and I got the itch that all gardeners do. I figured as long as I had made some solid progress in the yard, I might as well blog about it! As always, you can click on the photo to make it bigger and see the plants in all of their glory. Jason and I purchased a bunch of new plants this week. The amazing part is that we got them all in the ground the very night they came home. If you know me, you know that rarely happens. Heck, I still have plants that I paid good money for a year ago sitting in pots in the front yards! And no, they aren't container gardens. 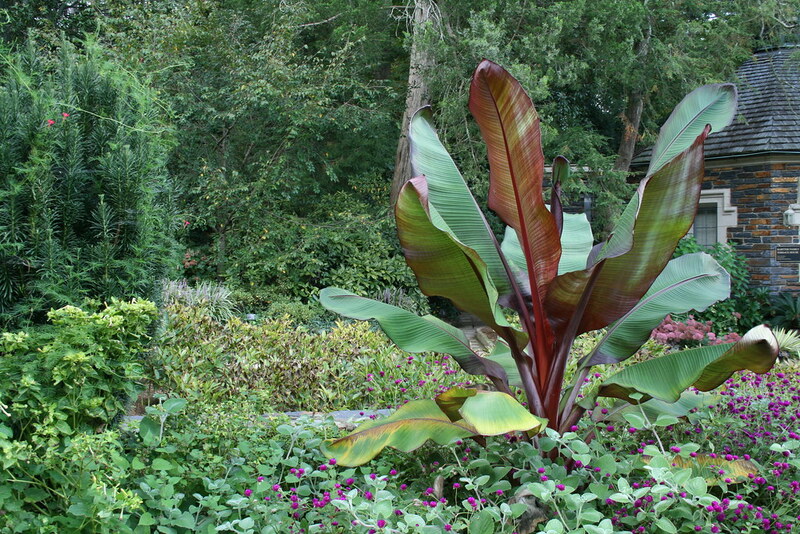 + Abyssinian banana (Ensete ventricosum 'Maurelii'). Can I just tell you how excited I am to finally have an ensete in the front yard? I've been lusting after this plant since I first saw it at a Garden Writers Association conference three years ago. I splurged and bought the biggest size I could find so that the plant could get itself nice and big before the freezing temperatures return in December. They're root hardy here, which is good, but the leaves tend to burn back. If you haven't ever seen the 'Fireworks' fountain grass, you should check it out. It's incredibly colorful. I'm not sure yet if it will survive our winters -- it's supposed to be Zones 9-11 and we're 8b -- but I'm going to give it a try. If it dies, I'll just put in something hardier. Speaking of ornamental grasses, the bamboo muhly grass that I brought back from GWA is still going strong. Jason and I debated about cutting it back but decided to leave it for now. And the river oats that I bought last year at Plant Delights Nursery are starting to come back, so that's good. We also a dwarf Cavendish banana in the front yard, courtesy of Tom. Apparently the squirrels in his yard wouldn't stop chowing down on it, so he decided that the only humane thing to do was to give away the plant. Lucky me! I guess his other option would be to shoot the squirrels, but that's probably less humane. And I can't get over how nice it all looked once we added a "mulch veneer," as our friend Erin calls it. We spent $30 and got eight bales of pine straw. They just barely covered all of the crappy looking mulch that we got for free from the power company. Not a bad use of resources, if you ask me. In the backyard, we planted the grow box with two 'Sweet Million' cherry tomato plants and also planted two jalapeno peppers in containers. And I finally got the fig tree in the ground after a year and a half. Yes, it's true. I'm hard on plants. Jason says I'm just "trialing" them to make sure they're hardy before I spend the time to put them in the ground. We still have a lot to do, though. We need to remove the azaleas under the front windows completely -- we cut them back last year, but that's as far as we got. We need to remove the stumps along the south edge of the property where we cut out the overgrown holly bushes and viburnum (yuck). That's where I'm planning to finally plant those yuccas, but I don't want to put them in until the stumps are gone. At any rate, it's been a busy gardening season so far. Who knows -- maybe it will be a good season for blogging too. Do you ever feel like you're branching in so many directions that something's got to give? If you're a regular reader (I know there's at least one of you), you've probably noticed that I haven't posted in four months. Shameful, I know. While I enjoy this blog, I'm not sure if I'll continue it. I've definitely enjoyed it, but I'm just having trouble finding time to blog. One issue is that I have a lot more on my plate at the office these days. 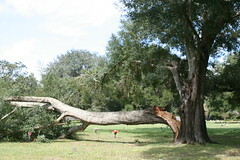 I'm writing more scripts for our radio show and working on a big project for Florida Master Gardener Program. I just haven't felt like I can spare the time to blog instead of focus on those other important tasks. And I also don't feel like I have the time to blog after work. Part of the reason why is that I've been spending more of my free time over at my craft blog, trying to make it better. So long story short, I'm on hiatus from this blog. Of course, I may get inspired now that it's springtime and there are plenty of things to blog about, but I make no promises. Thanks again to everyone who has been reading this blog, and I hope your gardens all bounce back beautifully this spring!